In a large bowl, sift together the flour, salt and baking powder. Set aside. In the bowl of an electric mixer fitted with the paddle attachment, beat together the butter and sugar on medium speed until fluffy, about 3 minutes. Add the egg and beat until smooth, about 1 minute. Add the reserved flour mixture and mix on low speed until thoroughly combined. Stir in the vanilla. Wrap the dough in plastic and refrigerate for about 45 minutes. Line two baking sheets with parchment paper. On a well-floured work surface, roll out the cold dough to 1/8-inch thick. 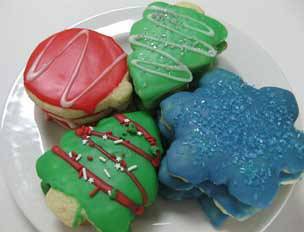 Use cookie cutters to cut out cookies. Transfer the cookies to prepared baking sheets. Bake for 8-10 minutes, until the edges are brown. In Recipes-list.com we have selected the most viewed recipes from category - uncategorized . Enjoy the best recipes specially selected for you! Aunt Missy’s Cut-Outs is the right choice that will satisfy all your claims.